CHAPTER ELEVEN: WHO STOLE THE TARTS? The King and Queen of Hearts were seated on their throne1 when they arrived, with a great crowd assembled about them  all sorts of little birds and beasts, as well as the whole pack of cards: the Knave was standing before them, in chains, with a soldier on each side to guard him; and near the King was the White Rabbit, with a trumpet2 in one hand, and a scroll of parchment3 in the other. In the very middle of the court was a table, with a large dish of tarts upon it: they looked so good, that it made Alice quite hungry to look at them.  "I wish they'd get the trial done," she thought, "and hand round the refreshments!" But there seemed to be no chance of this; so she began looking at everything about her to pass away the time. The twelve jurors were all writing very busily on slates.10 "What are they doing?" Alice whispered to the Gryphon. "They ca'n't have anything to put down yet, before the trial's begun." "Stupid things!" Alice began in a loud, indignant voice; but she stopped herself hastily, for the White Rabbit cried out "Silence in the court! ", and the King put on his spectacles12 and looked anxiously round, to make out who was talking. Alice could see, as well as if she were looking over their shoulders, that all the jurors were writing down "Stupid things!" on their slates, and she could even make out that one of them didn't know how to spell13 "stupid," and that he had to ask his neghbour to tell him. "A nice muddle their slates'll be in, before the trial's over!" thought Alice. One of the jurors had a pencil14 that squeaked. This, of course, Alice could not stand, and she went round the court and got behind hime, and very soon found an opportunity of taking it away15. She did it so quickly that the poor little juror (it was Bill, the Lizard) could not make out at all what had become of it; so, after hunting all about for it, he was obliged to write with one finger for the rest of the day; and this was of very little use, as it left no mark on the slate. "Call the first witness," said the King; and the White Rabbit blew three blasts on the trumpet, and called out "First witness!" The first witness was the Hatter. He came in with a teacup in one hand and a piece of bread-and-butter in the other. "I beg your pardon, your Majesty," he began, "for bringing these in; but I hadn't quite finished my tea when I was sent for." "Take off your hat," said the King to the Hatter. "Stolen!" the King exclaimed, turning to the jury, who instantly made a memorandum20 of the fact. "I keep them to sell," the Hatter added as an explanation. "I've none of my own. I'm a hatter." This did not seem to encourage the witness at all: he kept shifting from one foot to the other, looking uneasily ay the Queen, and in his confusion he bit a large piece out of his tea-cup instead of his bread-and-butter. "I ca'n't help it," said Alice very meekly: "I'm growing." 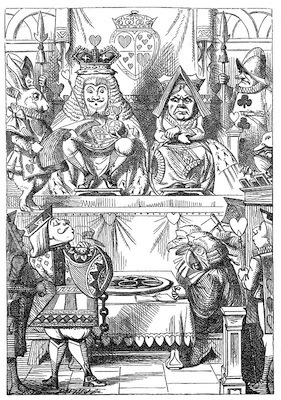 All this time the Queen had never left off staring at the Hatter, and, just as the Dormouse crossed the court, "Bring me the list of the singers in the last concert!" on which the wretched Hatter trembled so, that he shook off both his shoes. "I'm a poor man, your Majesty," the Hatter began, in a trembling voice, "and I hadn't begun my tea  not above a week or so  and what with the bread-and-butter getting so thin  and the twinkling of the tea "
"The twinkiling of what?" said the King. "Of course twinkling begins with a T!" said the King sharply. "Do you take me for a dunce?22 Go on!" 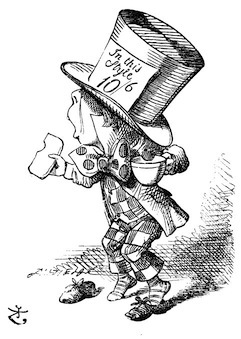 "I'm a poor man," the Hatter went on, "and most things twinkled after that  only the March Hare said "
"Well, at any rate, the Dormouse said " the Hatter went on, looking anxiously round to see if he would deny it too; but the Dormouse denied nothing, being fast asleep. "After that," continued the Hatter, "I cut some more bread-and-butter "
"That I ca'n't remember," said the Hatter. "I'm glad I've seen that done," thought Alice. "I've often read in the enwspapers, at the end of the trials, 'There was some attempt at applause, which was immediately suppressed by the officers of the court,' and I never understood what it meant till now." 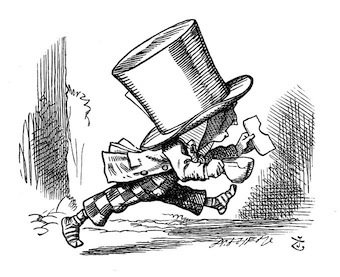 "I ca'n't go no lower," said the Hatter: "I'm on the floor, as it is,"
" and just take his head off outside," the Queen added to one of the officers; but the Hatter was out of sight before the officer could get to the door. The next witness was the Duchess' cook. She carried the pepper-box25 in her hand, and Alice guessed who it was, even before she got into the court, by the way people near the door began sneezing all at once. "Well, if I must, I must," the King said with a melancholy air, and, after folding his arms and frowning at the cook till his eyes were nearly out of sight, he said, in a deep voice, "What are tarts made of?" "Never mind!" said the King, with an air of great relief. "Call the next witness." And, he added, in an under-tone to the Queen, "Really, my dear, you must cross-examine the next witness. It quite makes my forehead ache! Alice watched the White Rabbit as he fumbled over the list, feeling very curious to see what the next witness would be like, " for they haven't got much evidence yet,"29 she said to herself. Imagine her surprise, when the White Rabbit read out, at the top of his shrill little voice, the name "Alice!" This term for the fancy chair or sometimes chairs those claiming to be royalty sit on means basically the same thing its Greek preceding term does, "an elevated seat." It may seem that the point of such a seat is to make the ruler visible, yet this was probably a secondary purpose. Thrones appear to be part of a long line of devices developed in hopes of making the person using them look bigger and more imposing than others, evidently on the bully principle. That said, the term 'throne' has been applied to seats that are in fact not eleveated at all, one of them a chair found in the ruins of 'Minoan' Crete. There is also a stone seat that clearly meets the 'elevated' criterion in these ruins, although the thing looks so ludicrously uncomfortable that its debatable whether a literal human being was ever meant to sit on it. The symbolic meanings of the throne are not entirely universal, however, and may not always tie back to making the person sitting on them bigger. The encient Egyptians apparently viewed the throne as no less than the seated form of the giant Goddess and founder of the current ruling house. Anyone ruling in the Goddess' name liked to have her or himself depicted as sitting on Her lap, either in the form of a child or as a much smaller adult figure. The hilariously tiny trumpet the White Rabbit is shown holding is evidently not the valved musical instrument most familiar today (somehow I expect a trumpet that small would sound something like a penny whistle without the slider). It appears to be an example of how trumpets started out, as long tubes with a bell at the end. The romans in particular were known for using ceremonial trumpets of this kind in various events since they could be used to make a colossal racket. Their shape and size made them quite awkward, until it occurred to someone to try curling up the tube to make the instrument more portable without spoiling its sound. Curled trumpets of great age have been found, so this idea was struck on very quickly. The development of the valve and key type of trumpet took the better part of one hundred years in europe. Parchment, as noted by Carl Pyrdum at Got Medieval notes, "is a fancy word for sheep or goat skin (and primarily sheep skin, because there were a lot more of them around)." These skins were so much work to make into something that could be written on that scribes reused parchment pages when possible, usually prepping the used sheets by turning them at right angles to the original writing direction and scraping off the original writing. Such reused parchment is referred to as a palimpsest, especially when the original writing remained at all visible. An especially famous palimpsest is one which started out as a copy of two treatises by Archimedes, The Method and The Stomachion. The pages were later reused in a prayer book. Since the rediscovery of the text underneath the prayers, scholars around the world have been working to recover it and posting their results and related information on the internet at the Archimedes Palimpsest website. True parchment is still used in a few limited areas today, especially decorative calligraphy and religious texts. Apparently the bizarre practice of wearing wigs if you were a lawyer or judge in england began when wigs in general came into fashion, and has lingered on like an unfortunate smell since then in england itself as well as a number of former british colonies. Occasionally you can even see canadian lawyers with mini-wigs on, which I believe means those lawyers are part of the criminal law system. So there is no reason to wear them except fashion at one time and now hanging onto a 'tradition' today (even where this would never have been a tradition!). There are other aspects of english judicial dress from the 1700s or so that are still in effect in some places. Again here in canada, tailed black jackets are still part of a legal representative's dress in criminal court proceedings. The frontispiece is an endangered species today, except in children's books for the most part. A frontispiece is simply an illustration that rests on the left hand facing page to the title page of the book. In this case, the frontispiece referred to is reproduced to the right of the red footnote number in the text. When wigs were in fashion, kings were indeed known to wear their crowns over them on occasion, especially large state events where the king was expected to sit still and speak, wave, and little else. This makes sense considering it would have been a challenge to walk around in a dignified manner with a large crown precariously perched on top of an elaborate wig. 'Creatures' has already been discussed in the previous chapter in note 26. More generally, this jury gives a whole new perspective on the right to be tried by a jury of one's peers defined in american law. The right to a jury trial is part of english law, although it is not set out in quite these terms. Whether legally a person accused of a crime is considered to have the right to not just a jury trial, but a trial by a jury made up of their peers or not, actually getting such a trial can be more or less difficult depending on the social conditions of the time and the person's race, class, gender, and religion. Here is one of many old effectively gender-neutral terms in the english language. The '-or' ending is a marker that the word refers to a person rather than a thing, regardless of the opinions of american dictionary makers. (Anyone who has struggled to get their word processing program to get their document spell-checked properly knows all too well about the opinions of american dictionary makers.) The term 'juror' had a more general meaning at first, referring to someone who had sworn an oath (the root of the word turns up in obscure terms like 'abjure'). Jurors are expected to swear to act and decide in an impartial and truthful manner. Evidently not, there's not a man to be found in that box of creatures. Until paper became cheap enough to make exercise books with, among many other things, children were expected to write out their exercises in school on small sections of the platy rock slate. The slates were often set into wood frames, and written on with a small rod of softer slate or pressed clay. Wikipedia lists soapstone as another thing used for writing on slates, but I'm not sure about this because soft as soapstone is, it is still rather hard to write with and can't be easily made into rods for writing with unless ground up and mixed with a binder first. In general, a slate was for temporary notes as the writing could be easily wiped off. It does seem sensible that each juror would want to be able to identify his slate from others, and the quickest way would be to put his name on it, except that to write it on the slate means it would be easily wiped off. If juries originally used slates, then I would be surprised if they weren't labelled with numbers or letters on their frames for identification during the day. It seems more likely that jurors would have used a more stable medium for their notetaking, however. 'Spectacles' being a fancy term for what are more often referred to as 'glasses' or 'eyeglasses' in north america. The term shows up more often in the singular as a reference to an event that is an especially unusual and striking sight. The tie to eyeglasses comes from the root of the word, which is a latin term for 'to look', spectare. This unfortunate juror was likely a victim of the extraordinary muddle of english spelling. English orthography was pinned down even as the language itself kept changing both in its word inventory and its pronunciation. The result is the language equivalent of a victorian curio box crammed full of fossils, oddities, and grotesques. To my knowledge, there is only one other currently spoken language with a similar spelling situation, and that is french. Written french is riddled with silent letters, multiple representations of the same sound, and combinations of letters that are sometimes sounded and sometimes silent. This is quite similar to english. One place the two languges diverge is in french's notable allergy to the letter 'w' which is rendered in several ways if it isn't dropped where it appears. (In fact, most words with replaced w's in french are loanwords from germanic languages.) Or at least, this is the more usual way spelling in the english language is discussed. Yet there is more than a bit more to be said. It is entirely understandable that english and french spelling would be a source of frustration to those learning to read those languages. While a person is still building vocabulary, any and all consistencies are a help and every exception to a rule is a bane. Until the first time they encounter a sentence where the differentiated spellings for words that sound the same render it understandable where context alone makes it ambiguous. Readers in english and french make more and more use of those differentiated spellings to read more quickly as their experience increases. However, no doubt this all sounds very theoretical. English has several words that don't change spelling between their present and past tenses like read, or that have the same spelling for a verb and an unrelated noun, like lead. Ambiguous sentences using such words can be confusing and strange to read, though admittedly they are fairly rare today. The 'pencil' here would be made of pressed clay or softer slate as already noted, and the most likely reason for it to squeak would be that it had a harder bit of rock or clay at the writing end. As it happens, I have heard dreadful squeaking on blackboards from cheaper grades of chalk, as the mix they are pressed from may not be well crushed or well mixed. Just why this sound is so appalling, especially in its fingernail induced version, continues to be argued and researched. Nobody knows, although it does seem likely that it is related to an inborn dislike of extremely high frequency sounds, and that the specific sound induced by fingernails on a blackboard causes the teeth to resonate unpleasantly. That said, Alice has rather a penchant for taking pencils or at the least taking control of them. She does just that to the White King as he tries to write in his memorandum book in her adventures in the Looking Glass world. It's hard to imagine how the knave could have had an opportunity to steal the tarts, though his motivation is easy enough to imagine. Based on pictures I have seen of older farm houses however, it was once not uncommon to set freshly baked items on or near a window sill. I suppose people were less concerned about flies then. Kitchens were frequently on the ground floor of the farm house, so items in the window could be easily reached. This would be a sensible use of the slates, to track what each witness said about a given event to help the juror in comparing and contrasting the different accounts. Considerable value is placed on eye-witness evidence in most courts, although psychological research strongly indicates that this may be the weakest sort of evidence. The reason for this has nothing to do with honesty or the lack of it. In fact it relates to the ability of the human brain to filter out information we don't need for what we're doing. So unless the event being witnessed somehow impinges directly on something we're trying to do, it is difficult if not impossible for us to accurately notice and remember details of that event. So if we assume that the jurors assumed that 14, 15, and 16 referred to amounts in pennies, then in shillings and pence the total would be 3 shillings and 9 pence. The King is a bit confused about cause and effect here, in a looking-glass world sort of way. On the other hand, given that he pardoned all the condemned croquet players of earlier, perhaps this might have been known as an empty threat  not that this knowledge was available to the Hatter, as the next paragraph shows. As the King's response shows, 'dunce' is a term for a stupid or at best slow person. The term has fallen out of use (unfortunately there is a large active vocabulary of newer put downs of this kind) in spite of a rather surprising history. The term is derived from the name of a formerly influential catholic clergyman named Duns Scotus. He was best known as a scholar who could speak and reason 'with subtlety.' This sort of description often marks out someone as a perveyor of bafflegab, a practitioner of sophistry. Socrates was also frequently accused of sophistry, arguing based on reasoning that is clever but untrue. In Socrates' case I think there are certainly grounds for the accusation, but I have not read information for or against it in the case of Duns Scotus. In any case, after the 16th century Duns Scotus fell resoundingly out of fashion and serious consideration among the newer scholars of the period. Those who espoused his ideas were denounced as 'dunces' who couldn't actually think or reason, although they could make it seem like they could to the uneducated. This appears to be an instance of 'protesting too much' to paraphrase Shakespeare. 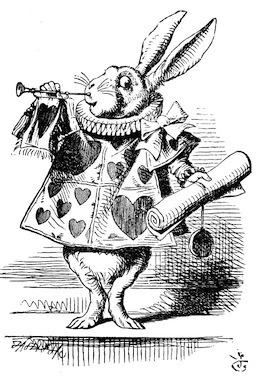 Of course, in a court of law it is possible to deny responsibility for a criminal act on grounds of insanity, and the Hatter never does repeat what he heard the March Hare or later the Dormouse, say. 'Suppress' means to stop something from happening, to stop something already happening, or to block the movement of information so it can't be thought or spoken about. There is a whole branch of psychology and psychiatry built up around the idea that people may choose to suppress certain memories that are unpleasant or otherwise difficult to deal with, leading to emotional or mental problems. There is such a thing as involuntary suppression as well, usually induced temporarily by panic or fear as in the case of the Hatter. Carroll is having fun with the literalistic meaning of 'suppress' which is to press down on something (not the same as to press against something, which is literally to oppress). In court, specific evidence may be ordered suppressed for reasons such as security or procedural fairness. If a witness testifying suppresses evidence on their own and is caught at it, they are considered guilty of perjury and may suffer quite severe penalties. Earlier Tenniel illustrated the cook as holding what looks like a possible pepper grinder rather than a box. It was not common to have ready ground pepper available until quite recently, and as any pepper connoisseur knows, ready ground pepper loses its flavour quickly as its essential oils are able to evaporate more easily than if the pepper was left in corns. Victorian era packaging of dry goods included cardboard boxes with a wax paper lining or a wax paper bag of the item inside. Legal cross-examination is a form of questioning intended to destroy a witness' credibility, especially by getting them to contradict their own testimony or own up to some act or belief that undermines what they have already said. Cross-examination is the usual climactic moment in court room dramas, even though in real life cross-examinations are rarely so dramatic. The King seems to believe that you cross-examine someone by looking as cross (that is angry or irritated) as possible while asking the witness questions. As a verb, 'to collar' someone is usually defined as catching them in the act of committing a crime, yet it really seems to refer to grabbing somebody by the scruff of the neck. The reference to people may go back to punishment of criminals by chaining them by the neck, the chain being a nasty rendition of a more domestic sort of collar. There doesn't seem to be any real reason to make such a fuss over the hapless Dormouse, although a person who seems determined not to behave according to the rules of a court can be declared 'in contempt' and removed or even arrested. Barring the tarts themselves, they have no evidence at all. Ironically, in real life law cases can go extended periods without much evidence apparently being brought forward. The whole process can be paused while the opposing lawyers introduce motions, arguments for the proceeding to be delayed, adjourned or otherwise altered. The presiding judge is required to rule on each one in a process that can literally take years in some cases.